Started in 2009, Forty Hall Community Vineyard when 100 local people planted an acre of grapes. 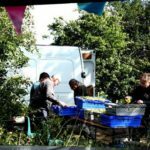 Since then, the site has grown into a 10-acre community-managed vineyard in Enfield, North London. 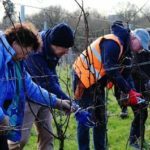 The biggest commercial vineyard in London since the Middle Ages, Forty Hall is run for and by the local community, on the 170-acre Forty Hall Farm site, which includes community orchard, market garden, forest garden and rears animals. Over 60 volunteers from all walks of life tend plant, prune and maintain the vineyard and harvest the grapes when ready for winemaking. But they also plan evens, staff stalls at markets and food events, do the press and publicity for the vineyard, lead teams and peer mentor each other. The profits made from wine sales and corporate away days are reinvested to run ecotherapy (or ‘green exercise’) for people who are marginalised or with mental health issues. The borough of Enfield is the 12th highest rate of depression in London and is home to 30,000 adults living with a mental health disorder (measured in 2012), so there is a high demand locally for services like Forty Hall’s ecotherapy. 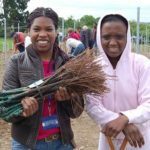 Volunteers also lead their own mini-projects and enterprises such as bee-keeping, clay oven building, running a walking group and willow weaving workshops. Power to Change awarded £10,000 to Forty Hall Community Vineyard through the Community Business Trade Up programme which enabled them to continue providing their services to the community and developed their an online store to sell the wine from the vineyard. The Trade Up programme also develops community business leaders to help with the sustainability of the organisation. In 2010, Forty Hall Vineyard constituted as a not-for-profit limited company and were awarded start-up funding under the Lottery’s Local Food initiative. Over time they developed a volunteer training and support programme, and learnt from English wine experts to grown their own grapes on a commercial scale. Their first harvest was in 2013. 40% of volunteers have felt they have improved their vocational skills and employability, 65% have improved their social and communication skills and all have felt an increase in self-confidence. Living with schizophrenia, I have found working at the vineyard has been an important part of my journey back to health. Green therapy at the vineyard worked for me and I have seen improvements in others. Coming to the vineyard gives structure to my week and gets me out of the house and into the fresh air. 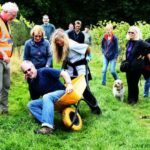 I enjoy working and socialising with the other volunteers – good for body and soul! You can find out more about Forty Hall Vineyard through their website and find out how you can get support them or get involved.